I'm listening. Technology's benefits, convenience, and 4G is more than we need. Follow along with me, please. With each "revolution" consider how what we human beings gained actually set us up for long-term future losses from which we, and this planet, are in danger of never making a recovery. All leading to The Frequency Revolution. The one we are currently in. The pitched , quick-fix upside leads to an insatiable appetite for more while the long lasting irrevocable downsides place our lives in situations and conditions that diminishes our well-being today and well into the future with no end in sight. These revolutions known as progress, these 13 steps on the ladder of progress that have brought us to the brink of being stuck on an uninhabitable planet that no longer supports life. These 13 steps contribute to an ongoing, incalculable extinction event which may include Homo sapiens sapiens. These 13 steps brought us education and religion that captured our souls, minds, bodies so we read what we were told to read, and believed what we read. These 13 steps brought us the Inquisition and the genocide of wise women. These 13 steps brought us rakes, hoes, plows, fences, knives, swords, guns, and the concept of property ownership and money. These 13 steps brought us splitting of the atom, unleashing unlimited power to kill in a bomb drop, through radiation therapy for the cancers to which these 13 steps make an enormous contribution. Feel free to complete the rest of this thought exercise on your own. Agricultural Revolution brought hoarding, hunger, and disrespect for the earth, brutalizing her into man-controlled food production which led to the use of money, anchoring the idea of money, wealth, and the power to control who has food. Now imagine these 13 steps all leading up to one GIGANTIC STEP that will change the course of the human species and the story of our intended spiritual stewardship -- STEWARDSHIP -- not ownership of this magnificent planet. Take your time. Think it through very carefully. See through the "progress" pitch and peer into the "profit" reality. This gigantic next step is the 5G Roll out, the Internet of All Things, and Artificial Intelligence -- all for your convenience, of course. Nothing at all to do with who controls your food, or your money, or your life. Take your time. Feel it. Go into the mind of a being that would plan this step by step, and wait patiently as generation after generation of human beings were led to the future that the 5G Roll out, when combined with A.I. will create on this planet. Who is this being? Where did this being come from? Where does the entity live? How long is its life span? Can you feel this thing breathing, invisibly, through your very body? Because we let it in with the choices we make about what we eat, what we drink, entertainment, our naivete, our gullibility, our innocence, our mind's inability to recognize a lie all the while our physical bodies are designed to know the truth. Now having asked these questions, we should have a sober conversation about the impeding Frequency Revolution. 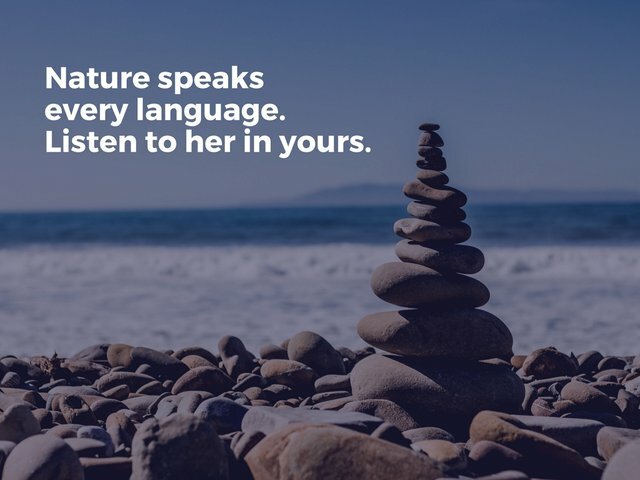 When I listen to Nature speaking she asks me to walk barefoot on her body and to be sure to leave the cell phone in the trunk of my car until I have the courage to throw it away and never look back, free of the addiction, free of the breath of the thing that is killing her, killing me, killing you. Slowly. And making money all the while. Then send a memo to @earthnation. Send 0.55 Steem Dollars with the url of this post. Very Cool post! I love the Age of Frequency!